This apple is painted quite fast with a wet on wet technique that will allow the different shades and tints and colours to blend into each other. More adult watercolour classes have been added to my schedule at the Thompson Community Centre in Richmond. If you are looking for some beginner instruction in the tricky medium of watercolour come join our class this spring. Each session we will try different projects such as learning to do washes using simple subjects such as fruit and misty mountain ranges, playing with negative space between fence posts, and scratching out highlights on sparkling seas and snow. There are 3 new sessions at the Thompson Community Centre. Phone 604-238-8422 for info and to register. We meet on Mondays from 1:00 to 2:30. The next session is March 2 – 23. Then the other two are April 13 – May 11 and May 25 – June 22. Hope to see you there! 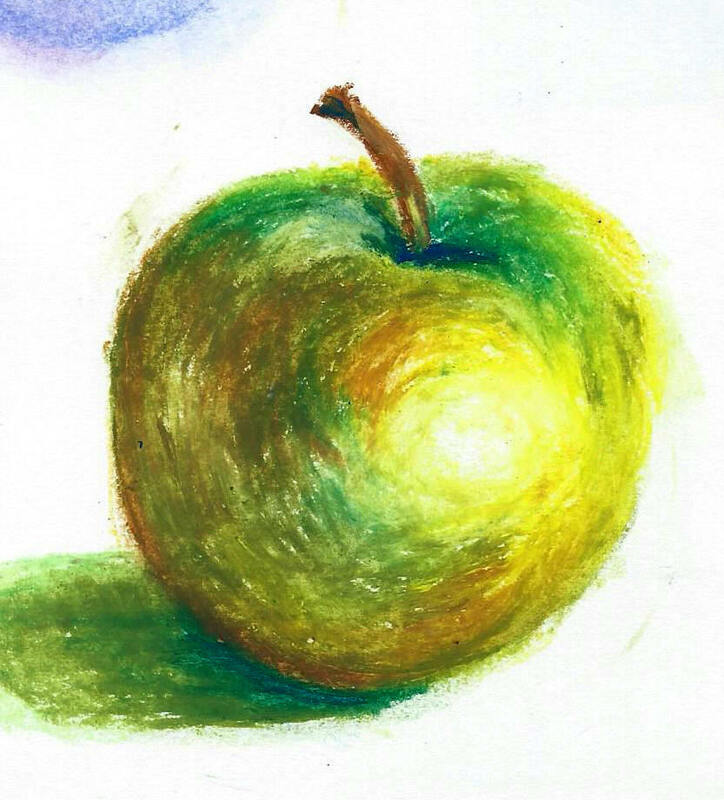 This green apple is in oil pastel, which is a little tricky to blend. Start with light strokes in a variety of colours and build up the layers. 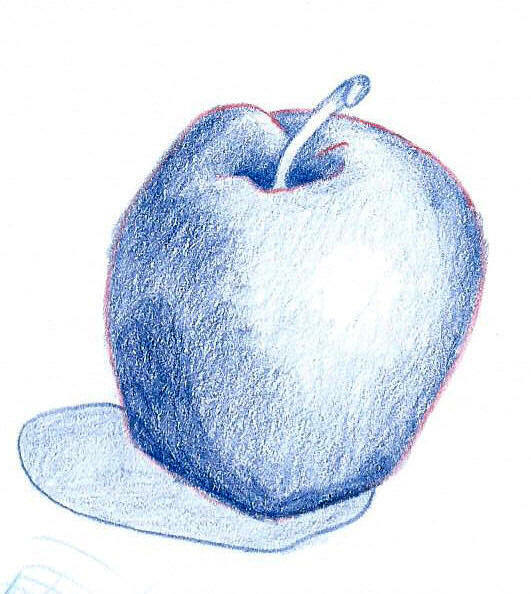 Here are some examples of the various apple studies I have taught in my watercolur, pastel, and pencil crayon classes for adults and children. I find that the apple lends itself well as a subject for beginners; it’s more interesting than just a circle and yet not so complex as to scare people away. The variety of colours found on apples are another plus as I always stress that a collection of colours is more interesting to the eye than a flat 1 colour subject (although that has its place too, such as in many poster designs and logos). 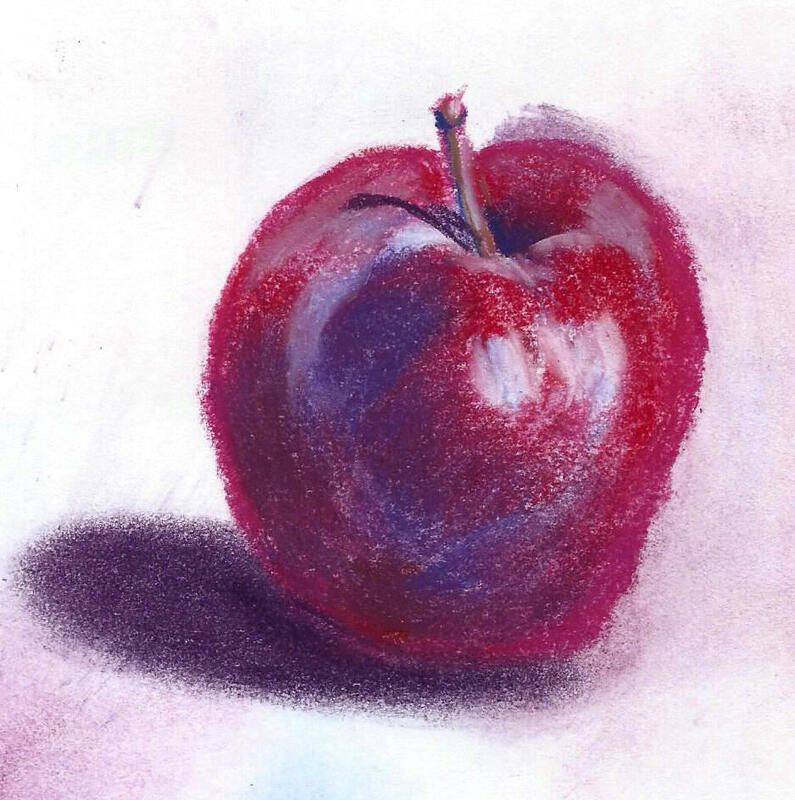 Soft, or chalk pastel was used on this apple and is much easier to blend than oil pastel. Whether it is watercolour, pastel, or pencil crayon, build up a layer of different colours, focusing on your main one, like red, but highlighting with ones such as yellows, and darkening with colours such as blues and purples. Start light, and work up the layers until you just do the dark areas at the end. Have fun, and experiment. 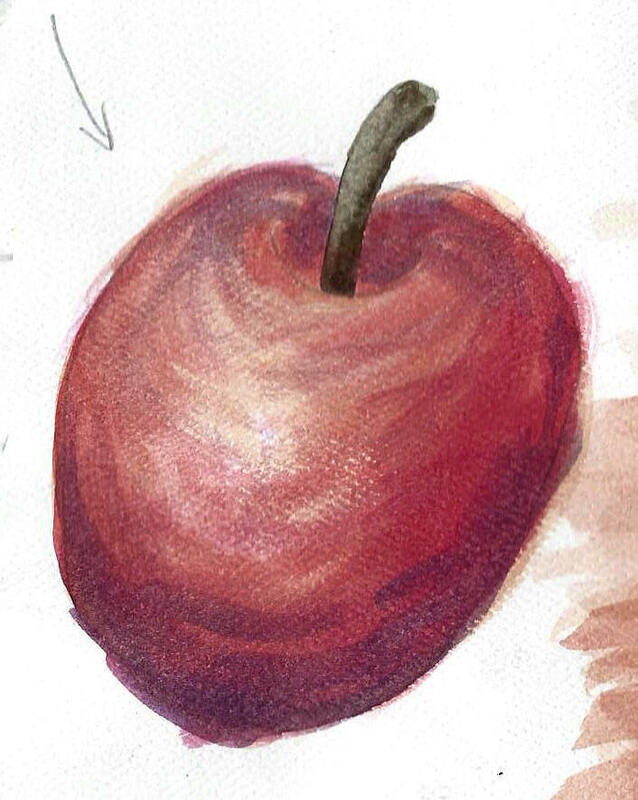 Paint and draw apples over and over again, as using the same subject will let you see your progress over time. 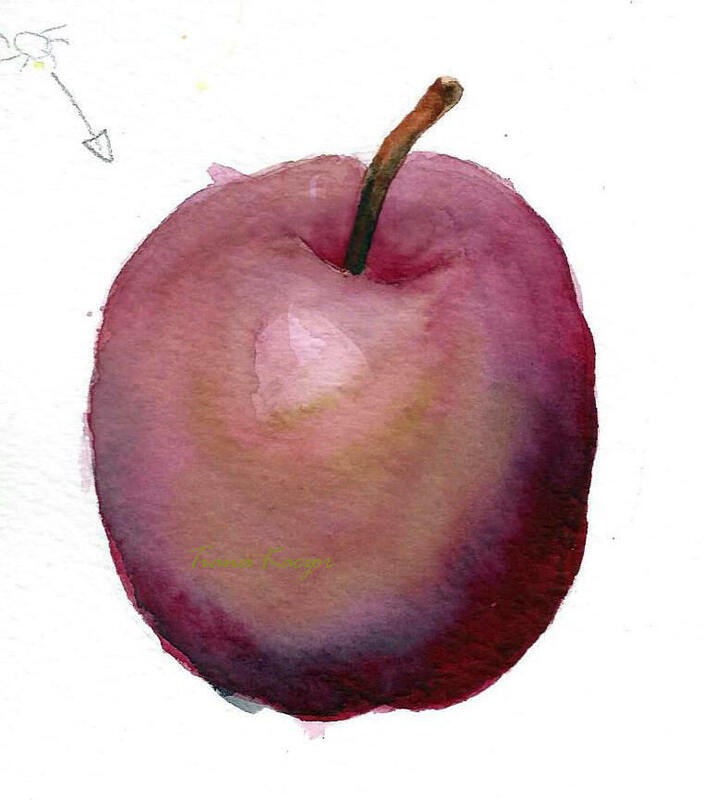 This apple had each layer of watercolour dry before the next layer or colour was painted on top and thus you can see some of the brush strokes and it doesn’t blend like the wet on wet apple shown above. A study in value where you only use one pencil crayon. Can also be done with regular pencil. Try a 3 or 4B.